An original look at history that profiles 30 children from different eras so that children of today can discover the lives of the cave people, Romans, Vikings, and beyond through the eyes of someone their own age. History books often focus on adults, but what was the past like for children? 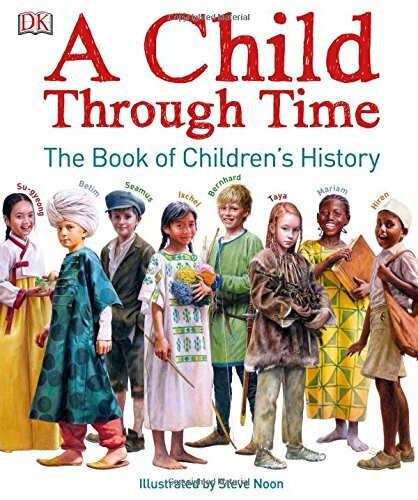 A Child Through Time is historically accurate and thoroughly researched, and brings the children of history to life—from the earliest civilizations to the Cold War, even imagining a child of the future. Packed with facts and including a specially commissioned illustration of each profiled child, this book examines the clothes children wore, the food they ate, the games they played, and the historic moments they witnessed—all through their own eyes. Maps, timelines, and collections of objects, as well as a perspective on the often ignored topic of family life through the ages, give wider historical background and present a unique side to history. Covering key curriculum topics in a new light, A Child Through Time is a visually stunning learning tool for children ages 7 and up.